Finance is a fantastic way to spread the cost of your purchase. To make it easy we've partnered with Duologi whose smart technology lets you apply for and then complete the loan application quickly and entirely online. When your order gets over £250 (ex. VAT) you can apply to spread its cost over 3–12 months with interest-free credit or up to 36 months at a 9.9% APR. The application process is simple, takes around 5 minutes to complete and you'll receive a decision within 30 seconds of completion. Kitting out a new salon? Order all your new kit and products, then spread the cost to help with your cashflow. Upgrade your cutting with a high-end Joewell, Jaguar or Kasho and spread the payment into manageable chunks. 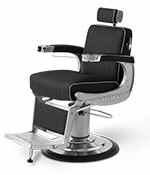 Take the stunning Takara Belmont Apollo 2 Barber Chair costing £1,849 + VAT, so £2,218.80 in total. Spread the cost over a year with 12 monthly payments of £184.90 at 0% APR. Have your order delivered to the address you put on the finance application, which must be the same as the billing address of the bank account you're applying with. Duologi will let you know the outcome of their decision in just a few seconds. It's important to know that when applying for finance a hard credit check is made and this is recorded on your credit file. In a very few cases, your application may be referred to a lender for manual underwriting. In such cases you'll be notified by email of the credit decision within 24 hours. If you're not approved for finance it could be for a variety of reasons. You should gain a copy of your credit file and this will be able to give you more information. Feel free to give us a ring on 01253 893091 or send us an email at sales@coolblades.co.uk, and we'll be happy to answer any questions you might have. Cool Blades Ltd is authorised and regulated by the Financial Conduct Authority, register number 832460 and acts as a credit intermediary. Finance is provided by Duologi which is a trading name of Specialist Lending Ltd. You will be offered the best rate available based on your personal credit history and Duologi's credit decision policies.